Radishes are maybe the king of the high reward plants. They grow outrageously fast, with some of them maturing in as little as 22 days. They grow in cool weather, germinating in soil as cold as 40 F. (4 C.), making them one of if not the first edible things in your vegetable garden each spring. They’re also incredibly easy to grow, taking off and producing with little to no human intervention, apart from some strategic thinning. They do grow better, however, with a little help in the form of radish plant fertilizer. 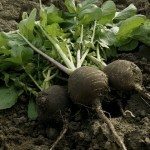 Keep reading to learn about radish plant food and how to fertilize radishes. Just before you plant your radishes, you should work some all-purpose fertilizer into the soil. Apply about one pound (0.45 kg) of 16-20-0 or 10-10-10 fertilizer per 100 square feet (9 square meters) of soil. Ideally, you should be planting your seeds in 10 foot (3 m) long rows spaced 1 foot (30 cm) apart, but you can scale down for much smaller spaces. Mix the radish plant fertilizer into the top 2-4 inches (5-10 cm) of your soil, then plant your radish seeds ½ -1 inch (1-2.5 cm) deep and water them thoroughly. If you don’t want to use commercial fertilizer, the same radish plant food effect can be achieved by working 10 pounds of compost or manure into the soil instead. So is one time enough when fertilizing radish plants? After you’ve applied your initial all-purpose fertilizer, your radish fertilizer requirements are basically met. If you want to provide a little extra radish plant food to kick your growth into high gear, however, try adding about ¼ cup of nitrogen rich fertilizer per ten foot (3 m) row to promote fast foliage growth, especially if you plan on consuming the greens.